I was terribly confused and disordered as I sat down to book tickets for my trip to Mumbai. I was to spend two days in Mumbai, catching up with old friends. I was confused between flying back straight from Mumbai or add up Pune to the trip. I had to catch up with some friends at Pune as well. My decision became clearer after checking fares on some OTAs. Fares out of Pune was much cheaper than similar timed flights from Mumbai - and the difference was quite substantial as well. 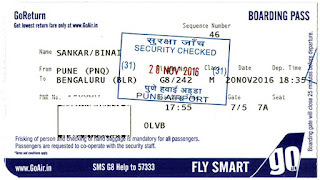 I opted for an evening flight out of Pune, and finally decided to fly Smart on Go Air 242. Shivneri: Navi Mumbai to Pune! Hours after landing in Mumbai, I was standing outside a dilapidated office that had rusting mesh seperating the outside world with itself. That was an MSRTC Reservation counter at Vashi Bus Station, in Navi Mumbai. 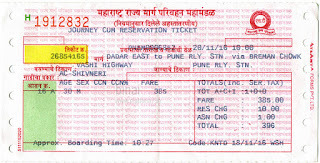 The MSRTC officer sitting at the counter was quite baffled when I went and asked for a ticket to Pune. He looked quite confused - and mumbled something that I couldn't understand. There was one more guy sitting inside the counter - he quickly said, we haven't been able to sell a single ticket today. The internet was down. Let's see if it works for you. My heart sank. The heart beats became faster and louder. The guy at the counter played around on his system - finally the login page opened, and he entered the required details. He gave an ear-to-ear smile and said "Sir, you are very lucky!" 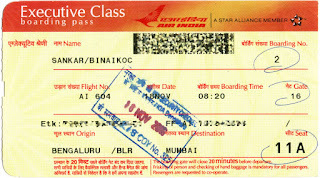 It was time to plan another trip to Mumbai - been planning a trip since a very long time. A friends get together and a whole lot of busfanning was on the cards. I was a bit choosy when I went about searching for flights. I was confused about the day of my flight as well - I wanted to be in Mumbai on Saturday, after a bit of searching around, I decided to fly on Friday, instead. I wanted to try my luck flying the new Airbus 320neo - but then the choices were very confusing. A lot of research went into identifying rotations that regularly got the Neo. Pricing sent my choices into a complete tizzy. I found a better price on Air India - just a hundred rupees or so more than Indigo, which had the new Neos on the sector. After some thinking around, I decided to dive in, and book the Air India. This would also happen to be my longest flight on the A321, plus a flight on the Maharaja! Craziness comes in different forms and in varying intensities. Busfanning is perhaps among the most severe forms of craziness. Busfanning is perhaps more intense than say Railfanning or Planespotting. To be technically speak, the last two are almost illegal owing to aged pre-independence era rules that we still follow. Buses are the most common form of public transportation in most parts of the country. Right from my childhood, I watched them with awe and always loved traveling by them. As a kid, I've even fascinated driving those monsters. Sitting on the bonnet was always a thrilling experience as a kid - seeing the driver struggle out with the steering, slamming the gears and playing around with the accelerator.